Groundbreaking Making Room exhibition at the Museum of the City of New York to transform into private dining room for the raffle winner and three friends. Executive Chef Chris Bradley of Untitled, a Union Square Hospitality Group restaurant, will prepare a three-course dinner in Resource Furniture-sponsored micro-apartment. Citizens Housing & Planning Council (CHPC), a non-profit research and education organization, announces a fundraising raffle event offering a once-in-a-lifetime New York City museum experience. The winner of “Making Room . . . For Dinner” and three friends, will be granted exclusive after-hours access to the Making Room: New Models for Housing New Yorkers exhibition in the third floor gallery of the Museum of the City of New York (MCNY) which will become their own private dining room. Executive Chef Chris Bradley of Untitled at the Whitney, a Union Square Hospitality Group restaurant, will prepare and serve the guests in the 325 square foot “LaunchPad” micro-apartment that is the centerpiece of this hugely popular New York City exhibition. 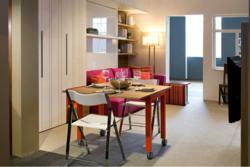 A three-course meal plus wine will be enjoyed among the many of transforming elements of this showcase micro-apartment. The kitchen is made in Italy by Key Cucine, and features a four-person dining table that folds away to store under the kitchen counter when not in use. The folding dining chairs hang on a wall bracket and require only 6” of space. The couch becomes a bed in 10 seconds. There is a hidden bar behind a sliding TV panel. The entire apartment morphs to fit the occupant’s needs throughout the course of the day. LaunchPad was built by Clei s.r.l and Resource Furniture, with interior design by architect Pierliuigi Colombo. The dinner will take place on April 25, 2013 from 7:00 – 10:00 p.m. The winner will be announced on April 18, 2013. All proceeds benefit Citizens Housing & Planning Council, a 501c(3) organization. Clei s.r.l. , based in Italy, has been fusing high design, innovation and patented technology since 1962. Their modern and easy to use transforming wall bed systems are the result of a company philosophy with strong emphasis on research, creativity, and engineering, with fully integrated, modular sleeping, storage, seating, and working solutions. Clei systems are available in North America exclusively at Resource Furniture. Making Room: New Models for Housing New Yorkers is organized by Donald Albrecht, Curator of Architecture and Design, and Andrea Renner, Andrew W. Mellon Post-Doctoral Curatorial Fellow at the Museum. Jerilyn Perine and Sarah Watson, of Citizen Housing & Planning Council, provided the primary research content underlying this exhibition. The exhibition installation is designed by Pure + Applied. New York City Planning Commission Chair Amanda Burden and New York City Department of Housing Preservation and Development Commissioner Matt Wambua are the show’s honorary co-chairs. Photos courtesy of the Museum of the City of New York.